The National Oceanic and Atmospheric Administration (NOAA) runs the National Climatic Data Center (NCDC), which releases data on the weather patterns in the United States. Included in the NOAA-NCDC's data is information on the rainiest places in the USA. This touches on the cities that have the rainiest days as well as the places that have the most annual precipitation. Forty-five inches (1143 millimeters) of precipitation appears to be the threshold used by NOAA-NCDC to outline the wettest places in the United States. The very wettest places far exceed that threshold. 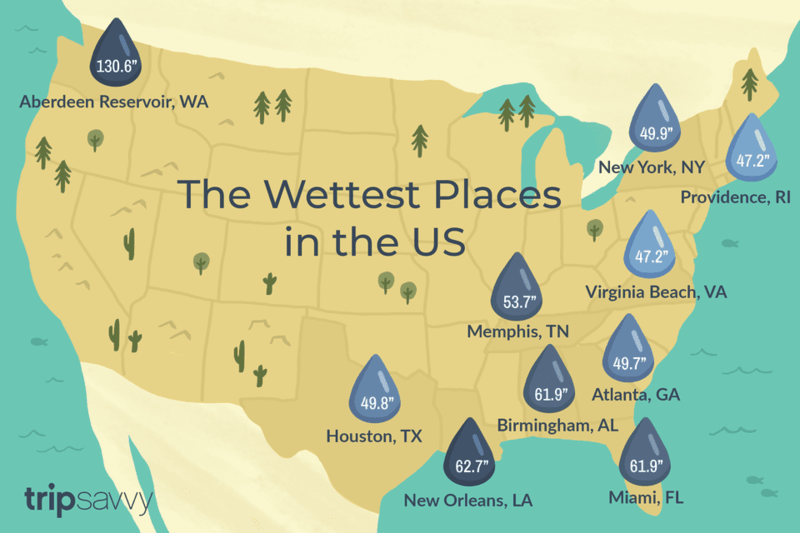 According to NOAA-NCDC data, the wettest place in the United States is Mt. Waialeale on Kauai in Hawaii, which gets approximately 460 inches (11,684 millimeters) of rain each year, making it one of the rainiest spots on earth. In Alaska, Little Port Walter on Baranof Island takes the crown for the most rain and snow measured in that state with approximately 237 inches (6,009mm) of precipitation (rain and snow) annually. Meanwhile, the absolute wettest places in the continental United States are located in the Pacific Northwest, with Washington State's Aberdeen Reservoir taking the top spot with an average yearly precipitation of 130.6 inches (3317mm). Whether you love or hate the rain, it’s always good to have an idea of what to expect on a big trip. If you’re planning a trip to one of the rainiest cities in the U.S.A., you should double check the weather, and make sure you bring all the necessities—a raincoat, boots, and an umbrella! Finally, NOAA-NCDC provides information on U.S. cities where it rains or snows more than 130 days annually. The majority of the cities in the top 10 are those near the Great Lakes, which are very prone to heavy lake-effect precipitation that makes. The above data are based on the NOAA-NCDC Normals measured from 1981 to 2010, this is the ​latest information currently available. What Is New England Like in June?